While different exercises focus on different muscles, all the parts of the body are still required to work together, making upper body exercises essential for the successful athlete. Strong arms are important in running, biking, lifting and aerobics. Strengthening your upper body, especially the shoulders and back, will give you the posture to fight unnecessary injuries and maintain form in workouts. 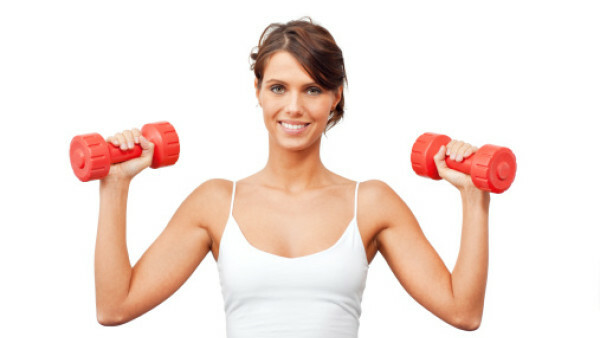 Toned and strong arms will help you in other exercises that rely heavily on your legs. Working the upper body also has its benefits in strengthening abs and core muscles and burn calories at a faster rate. Solid posture is important for aesthetic appeal and to prevent back pain even when you’re not working out. The best way to achieve proper posture is to tone back and shoulder muscles, strengthening them to hold the top half of your body up. A strong upper body will help you maximise the benefits of even the most leg heavy exercises. Many elliptical machines have spots for you to pump your arms, so solid shoulders and biceps will help you move at a faster pace and burn calories at a higher rate. This move engages your biceps, shoulders and triceps. Raise the dumbbells to shoulder height on each side and twist so that your palms are facing your body. The dumbbells should now be positioned in front of your shoulders. Your back should be straight and there should be a slight bend in your knees. Do not pause at the top of the movement, begin lowering the dumbbells back down to the starting position – twisting at the wrist until your palms are facing your body once again. This move engages your rear delts, the muscles at the backs of your shoulders. Select the desired weight from the rack then take a few steps back into an open area. This engages shoulders, delts, abs, biceps and triceps. Bring your elbows up to just below shoulder height with one dumbbell in each hand. Open up your arms into a field goal position, stretching them back to activate your shoulder blades. Drop your forearms down so that they are parallel to the ground. Lift them back up into field goal position and close them in front of your face. Repeat 10 times while keeping your elbows up and your core engaged. This move is a double hit on your triceps so you will feel the burn. The resistance should be resting in the palms of your hands with your thumbs around it. The palm of the hands facing up towards the ceiling. Keeping your upper arms close to your head with elbows in and perpendicular to the floor, lower the resistance in a semicircular motion behind your head until your forearms touch your biceps.